Football is finally back and Thursday and Sunday's games are in the books! Let’s jump into Week 1 of Fantasy Football Wrap Up, where we’ll be reviewing the best and the worst fantasy performances from Thursday and all of Sunday's games, broken down by position. 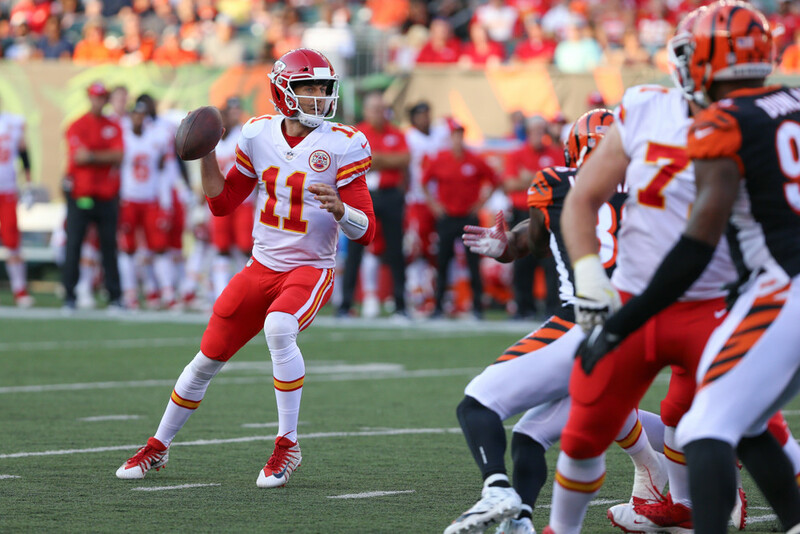 Alex Smith started the fantasy year off strong, throwing for 368 yards, 4 touchdowns, and 0 interceptions, good for 31.02 fantasy points in 4-points per touchdown leagues. At the time of writing this, he is currently ranked 1st out of all QBs leading into Monday night’s matchups. Detroit’s Matthew Stafford was able to bounce back after throwing an INT on his first pass of the season, throwing for 292 yards, 4 touchdowns, and 1 interception which resulted in 27.08 fantasy points scored and is currently ranked the 2nd highest scoring QB for the week. New England Patriots’ Tom Brady disappointed fantasy owners on Thursday night, as he threw for 267 yards and failed to throw a touchdown pass. Penalties certainly affected his stats this week, as there were several pass-interference calls that lead to short-yardage touchdown runs by Mike Gillislee. As a result, Brady only managed to score 10.68 fantasy points, which currently ranks him as the 15th QB this week. Going into the week, most Andrew Luck owners who were looking to stream a QB looked to Arizona Cardinals’ Carson Palmer who was facing, according to last year’s stats, a weak defense in the Detroit Lions. Palmer was only able to complete 27 of 48 passes for 269 yards while throwing 1 touchdown and 3 interceptions (including a pick-six). Palmer’s lone touchdown was a 1-yard pass within the last seconds of the game and he finished as the 19th ranked QB with 8.96 points. Kansas City Chiefs’ rookie running back Kareem Hunt began his NFL career with a lost fumble on his very first carry, however, was able to run all over the Patriots defense. He ran for 148 yards and 1 score while turning his 5 receptions into 98 yards and two touchdowns, a total of 45.60 points in full-PPR leagues which ranked him as the 1st out of all players in Week 1. During the same game on Thursday night, Patriots’ goal line running back Mike Gillislee was the beneficiary of many pass-interference calls which set up his offense inside the 5-yard line. Gillislee ran for 45 yards on 15 carries and scored 3 touchdowns on runs from the 2, 2, and 1-yard line. This resulted in the 2nd highest RB fantasy point total of the week with 22.50. The first two picks in almost every fantasy football draft in David Johnson and Le’Veon Bell disappointed all owners on opening week. Johnson’s day was cut short due to injury, and he finished with 91 total yards and failed to find the end zone, resulting in 13.10 fantasy points. Bell finished with only 10 carries for 32 yards, caught 3 passes for 13 yards, and did not score a touchdown. Bell ended the day with 7.70 points. Tyreek Hill certainly lived up to his twitter handle Thursday as he burned the Patriots in prime time for 133 yards on 7 receptions, and 1 touchdown while rushing for 5 yards on 2 carries. Hill’s fantasy points led all wide receivers this week with 26.80 points. Rookie Kenny Golladay proved that his preseason performance wasn’t a fluke by catching 4 catches for 69 yards and 2 touchdowns. Golladay finished Sunday with the 2nd highest wide receiver total with 22.90 points. Coming into this season Steelers’ Martavis Bryant was one of the most exciting boom-or-bust type players; Sunday, he busted. While Bryant was targeted 6 times, he only was able to secure 1 catch for 14 yards, leading to a fantasy score of 2.40 points. Carolina Panthers’ Kelvin Benjamin left owners wanting more, only managing 1 catch on 5 targets for 25 yards, scoring 3.50 fantasy points. Steelers’ Jesse James took advantage of the rare 8 targets he was given catching 6 passes for 41 yards and 2 touchdowns, leading to 22.10 points. Falcons’ Austin Hooper was seldom used but made the most of it when targeted. Hooper saw 2 targets yet turned that into fantasy gold with receptions of 40 and 88 yards with 1 touchdown for a total of 20.80 points. Tyler Eifert caught his only target for 4 yards and failed to score in a game in which the game script was in their favor. Eifert will need to earn the trust again of fantasy owners after posting 1.40 points. With an offense that put up 35 points, Eric Ebron failed to get involved on Sunday. Ebron had 2 receptions for 9 yards and 0 touchdowns, leading to 2.90 fantasy points. The Baltimore Ravens Defense was impressive this week as they shut out their division rival Cincinnati Bengals. The Ravens finished with 5 sacks, 4 interceptions and recovered a fumble. A much improved Jacksonville Jaguars Defense pummelled a combination of Tom Savage and DeShaun Watson, totalling a whopping 10 sacks, 1 interception and recovered 3 fumbles, while only allowing a lone touchdown to be scored against them. The highest scoring kicker from this past week was Giorgio Tavecchio from the Oakland Raiders, who, in his NFL debut, booted 4 field goals of 20, 52, 52 and 43 yards while adding two extra points. Los Angeles Rams’ Greg Zuerlein made 3 kicks from 50, 35 and 44 yards and added 5 extra points.